Presbyterians believe that Scripture shows that God manifested himself in three ways -- as Father, Son and Holy Spirit. The Presbyterian Church is a protestant denomination that believes in a triune God that expresses himself in three ways -- as Father, Son and Holy Spirit. The denomination emphasizes the sovereignty of God and strives to emulate the teachings of Jesus Christ by helping the hungry and poor and by reaching out to non-believers, or strangers. Presbyterians believe in Trinitarian baptism. During the process, babies or adults receive baptism through the sprinkling of water, the pouring of water, or by being dipped into water during a ceremony that is said to symbolize Christ's death and resurrection. Once a believer is baptized, he is said to have become a part of God's family. Trinitarian baptism refers to baptism in the name of the three persons of the Trinity -- Father, Son and Holy Spirit. Presbyterians and other Christian churches practice Trinitarian baptism based on the passage Matthew 28:19: "Therefore go and make disciples of all nations, baptizing them in the name of the Father and of the Son and of the Holy Spirit ... " During a Trinitarian baptism, the presiding minister applies the water and states publicly that the candidate is being baptized in the name of the Father, the Son and the Holy Spirit. The baptism ceremony is carried out during a Sunday church service and is part of the worship liturgy; therefore, the baptism follows the proclaiming of the Word and precedes the Eucharist -- sharing of the bread and wine. 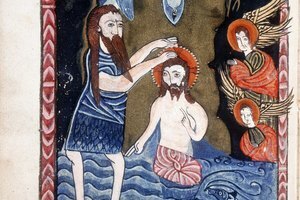 The baptism rite is carried out by the minister and begins with a presentation of baptism by references to several Bible passages that explain the significance of baptism. Next is the profession of faith in which the candidate declares his desire to be baptized, renounces sin and evil and recites a statement of faith. 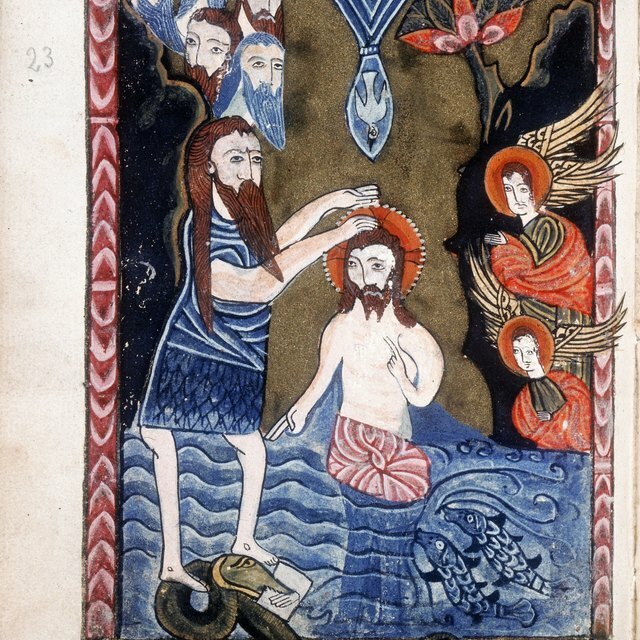 Then, the candidate is baptized by the minister, who sprinkles or pours water on his head or immerses him into water. The baptism ceremony ends with the minister laying hands on the newly baptized candidate, inviting the Holy Spirit to guide him. At that time, the congregation welcomes the candidate into the church family. The Trinity is evoked three times during the Presbyterian baptism. First, during the Profession of Faith, the candidate recites a statement of faith, known as the Apostles' Creed declaring that he believes in "God, the Father almighty, creator of heaven and earth," and that he also believes in "Jesus Christ, God’s only Son, our Lord, who was conceived by the Holy Spirit, born of the Virgin Mary ... " and that he believes in the Holy Spirit. Later in the ceremony, when the minister blesses the water, he states, "To you, Father, Son, and Holy Spirit, one God, be all praise, honor, and glory, now and forever." Finally, when applying the water to the baptism candidate, he says, "I baptize you in the name of the Father, and of the Son and of the Holy Spirit." Generally, the Presbyterian Church teaches that baptism is a one-time event and does not re-baptize believers from other Christian traditions. However, there is some concern raised for persons who have been baptized in other traditions, but not in the name of the Father, Son and Holy Spirit; therefore, in some churches, those persons may, upon request, receive the Presbyterian Trinitarian baptism. Similarly, some Presbyterian congregations permit those persons who are uncomfortable with their infant baptisms to be baptized again as adults. Longren, Trudie. 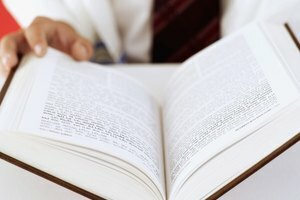 "Is the Presbyterian Baptism Trinitarian?" 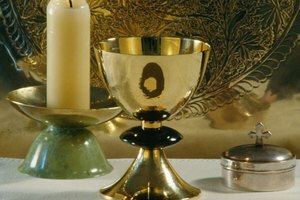 Synonym, https://classroom.synonym.com/is-the-presbyterian-baptism-trinitarian-12087288.html. 29 September 2017.